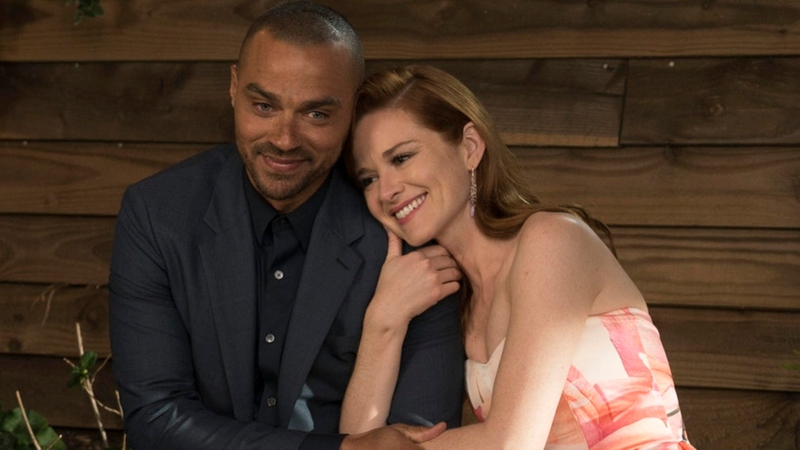 Grey’s Anatomy fans who long ‘shipped (and, let’s be honest, are still ‘shipping) Jesse Williams’ Jackson and Sarah Drew’s April could see their greatest hopes realized in season 15 — at least, they will if Williams has his way. Speaking to TVLine on Friday, Williams admitted he “would love” for Drew to return to the medi-drama. Sit tight, though, superfans; it isn’t a done deal yet. But we certainly can’t rule it out. After all, Grey’s surprised everyone by not killing off Drew’s character or the other big departure of season 14, Jessica Capshaw’s Arizona. Why leave the door open if they didn’t at least entertain the idea of April or Arizona making future cameos? In response, Williams told TVLine he thought April returning would make a terrific arc on the series. And fans are 100 percent here for it, especially in light of the fact that Williams’ Jackson just found out that his mother, Dr. Catherine Avery Fox, has been diagnosed with a particularly aggressive type of bone cancer. The prognosis isn’t good, and fans argue that April — who was very close to Catherine — should be there to help Jackson through this difficult time. @iJesseWilliams happy that you get some meaty work next week. I know you’ll do great. wish April was there for him. though. with their history and April and Catherine’s history it’d be an amazing story. I just keep thinking how special it would be with april. The April whose seen firsthand how complicated Jackson and Catherine’s relationship is. Now it’s just generic. You know, I am 101% sure that April would visit Catherine after her diagnosis. They might have their differences but she's still her daughter's grandmother and she was there for April when Samuel died and helped her through it. Shame Grey's Anatomy screw that up. Even if Drew doesn’t return to Grey’s anytime soon, though, it doesn’t mean she isn’t still working with her former costars. In October 2018, she starred once again as the wife of Justin Bruening, who played EMT Matthew on Grey’s, in Indivisible. Drew is currently starring in A Cohort of Guests, a short film costarring none other than Grey’s Kelly McCreary, aka Jackson’s new love, Maggie. Given Drew’s consistent ties to the Grey’s cast and crew, along with the fact that she truly seems to be adored by the Grey’s fam (Williams told TVLine she was “one of my favorite people in the world”), we’re not ready to give up hope on April popping up in the halls of Grey Sloan sometime in season 15.